Tripp Lite's premium UPS replacement battery cartridges breathe new life into UPS systems suffering from expired or weak internal batteries. Each replacement battery cartridge is carefully screened and certified to meet or exceed original manufacturer specifications and ships ready for installation into your UPS system. Reusable packaging holds expired batteries for recycling center delivery. Extend the life of your Tripp Lite SMART2500XLHG Medical-Grade Line-Interactive UPS System with the RBC48V-HGTWR 48V UPS Replacement Battery Cartridge. 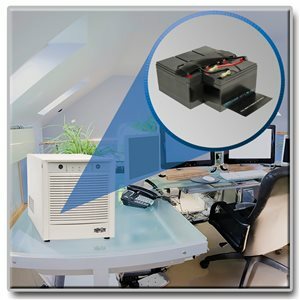 It breathes new life into UPS systems suffering from expired or weak internal batteries. The cartridge contains four 12V batteries. Note: See Tripp Lite's UPS replacement battery web page to confirm compatibility and quantity required. Like every Tripp Lite battery cartridge, the RBC48V-HGTWR is carefully screened and certified to meet or exceed original manufacturer specifications. This battery cartridge ships pre-assembled and pre-wired for quick and easy installation in your UPS system. Its reusable packaging holds expired batteries for recycling center delivery. The RBC48V-HGTWR comes with an 18-month warranty (U.S. and Canada). It’s manufactured in compliance with strict RoHS specifications, reflecting Tripp Lite’s commitment to environmental responsibility.